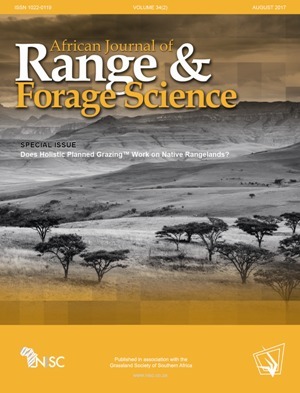 African Journal of Range & Forage Science, Volume 34, Issue 2 is a special issue titled, “Does Holistic Planned Grazing™ work on native rangelands?”. The balance of papers in this Special Issue show how Holistic Planned Grazing™ is managed and where it is used impacts the efficacy of the approach. The Introduction of the special issue has been made available to read at no cost until the end of October 2017 here. The special issue includes research and review articles based on several aspects of Holistic Planned Grazing. Hawkins meta-analysis of the effect sizes of Holistic Planned Grazing versus season-long grazing provides a quantitative overview of evidence to day. This position paper, titled, “A global assessment of Holistic Planned Grazing™ compared with season-long, continuous grazing: meta-analysis findings” has been published Open Access. Two review articles, authored by Teague & Barnes and Fynn et al.provide overviews of rangeland management systems in the context of both our understanding of mechanistic processes and a systems overview, or farmer’s eye perspective. The Teague & Barnes article, “Grazing management that regenerates ecosystem function and grazing and livelihoods”, and the Fynn et al. article, “Optimal grazing management strategies: evaluating key concepts”, can be viewed at no cost until the end of October 2017 by clicking on the respective titles. Read more about the African Journal of Range and Forage Science, submission information and subscription details here.